Bunting is one of those things that I don't really know what I'd do with 10 metres but I need it. There's something about the pastel colours and vintage-y patterns that I just love and want to completely adorn my house with. When I moved to uni I decided that I was going to buy some but turns out it's bloomin' expensive so I gave it a miss. 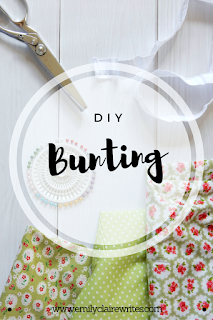 Earlier this year I became pretty obsessed with The Great British Sewing Bee and promptly decided that I was going to sew pretty much everything anything that I could, including some bunting. After endless searching through Pinterest for DIYs and not really finding any of them that easy to follow I decided to kinda just go for it. I have to say I'm really impressed with the result, it was much easier than I thought it would be so I'm sharing my easy DIY bunting. For the flat template I just cut a triangle 6 inches by 8 inches out of some card, this seemed like the best size as it's not too small but it's not hugely big either, but you can experiment a bit and decide on a size you like. The first thing to do is to use the template to draw a load of triangles on the material and then cut them out. Along the shorter base line I just used straight cutting material scissors and then for the longer edges which will be on show I used pinking shears to prevent fraying. It's much easier than hemming all the triangles and I think it looks quite pretty too. To give you an idea of how many flags to cut out I tried to come up with some kind of maths sum thing, but maths is definitely not my strong point and it failed completely! I made about 3 metres of buntning, and found that including gaps, 18 flags 6 inches across filled it up. Next I ironed the tape in half to create a flap for the flags to be sewn in between. Once it's ironed out to get the crease in it's much easier to pin flags into, however, if you're using bias binding it may already be folded over. I left a couple of inches of tape free from flags for pinning or tieing up and starting pinning flags in place. I allowed an inch gap in between and after pinning on 3 flags I tacked them in place using a darker coloured thread. This can seem like a bit of a faff, but it allows the fabric to be flatter when it comes to sewing and you haven't got to worry about taking pins out as you sew. Once you've got all your bunting flags in place it's time to sew it all up, using a sewing machine 3 metres really doesn't take too long. All that's left now is to pull out the tacking stitches, tidy up the ends of the tape using pinking shears again and then iron out any creases in the flags. And there you have it, easy bunting. I'm already planning on making more and have it everywhere in my uni house. Will you be having a go at DIY bunting?